Do-It’s R-5125 Hang Tab securely attaches to the inside of the Hanes product box. 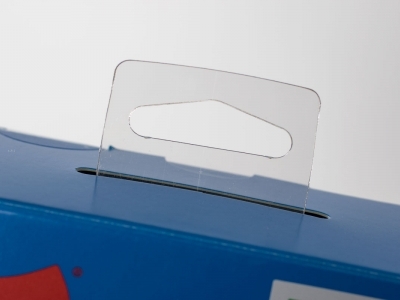 The hang hole portion of the clear 20 mil plastic hang tab fits neatly through the die cut slot at the top of the package. The result is a sturdy hanging package that sets Hanes apart from the competition and remains attractive in any retail environment.